Also known as the Maggi Plant. The leafstalks and stem bases can be blanched and eaten as a substitute for celery. 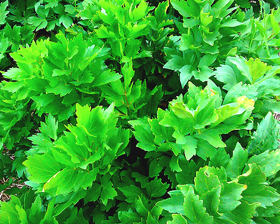 Chop the young leaves into salads, soups, omelettes, stews and casseroles. The seeds are often used to flavour soups, breads and biscuits. Sow seed thinly, 13mm deep in drills 30cm apart in awell prepared seedbed in full sun or partial shade.